While most people have a tendency to try and present the best version of themselves – spinning small yarns of white lies to protect feelings or reassure someone you really do like their homemade gift of scratchy wool polka dotted socks – there are those who lie so often and easily that it’s their main conversational approach from one situation to the next. And in Woody Allen’s twenty-first Writer’s Guild nominated original screenplay Blue Jasmine, he’s created one of his most fascinating (anti)heroines in at least two decades of filmmaking via the eponymous Jasmine brought so unnervingly to life with unparalleled tenacity by Oscar winner Cate Blanchett in yet another remarkable performance that’s poised to garner her a second Academy Award. Named Jeanette at birth but later changing that handle to the seductive Jasmine to suit the romantic life she dreams for herself as a hopeless fantasist, Blanchett’s Jasmine is the type of individual who’s taken the theory that we’re all the star of our own “movie” quite literally. Living a life of theatricality, Jasmine speaks in soliloquies to nobody in particular and hopes for a new plot twist whenever things don’t go her way. One of those aforementioned individuals who’s told so many lies, half-truths and slightly altered accounts and likewise been lied to (and played like a record by her dreamy, manipulative older husband Hal) – when we first meet Jasmine it only takes us a moment to realize that she can no longer tell the difference between fact, fiction, reality or fantasy. And while admittedly for a woman who’s been heartbroken and suffered a nervous breakdown in the past, the title Blue Jasmine fits accordingly, it doubles as a recurring theme in its own right as the start of the tale Jasmine tells to anyone who will listen how Hal met her standing alone at a party while the song “Blue Moon” was playing and swept her off her feet. Moreover, that pitch-perfect “Blue Moon” lyric of Jasmine standing alone serves a dual purpose in Allen’s film as it also foreshadows Jasmine as a woman who will always be somehow left off center, off to the side, outside looking in at the real world she rejects when it’s judged side-by-side with her own fantasy. In a telling flashback, Alec Baldwin's Hal confesses that he fell in love with her name which – because it is in itself a lie – reaffirms the fact that he fell in love not with the woman but with the idea or fantasy of her. Therefore, we realize that Hal not only never really knew this woman he called his wife at all but also – considering the way he created his Madoff like Ponzi schemes – preferred a life of magical reality than actual reality and therefore inspired Jasmine’s tendency to do the same before their lies all came crashing down like a house of cards. 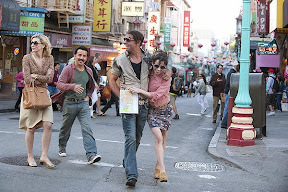 A delicate romantic who is having a tough time getting back on her feet after she lost everything and was ostracized from her Park Avenue social circle following the FBI's arrest of her shady, philandering husband for Madoff-like crimes, Jasmine travels to San Francisco to stay with her adopted younger sister Ginger (Sally Hawkins). Upon first glance, Jasmine seems like she’s wandered in from Tennessee Williams’s Glass Menagerie or Streetcar Named Desire as a Blanche DuBois type dependent upon the kindness of strangers. And it's a reference that fits indeed as further research reveals that Blanchett had recently played that role on Broadway and Allen had actually nixed a scene in Jasmine that took place on a streetcar for fear it would be deemed too much of a dead-on homage. And while the hint of DuBois is a given, in my eyes however, I see Jasmine as a distinct Woody Allen character with roots in the auteur’s onscreen Annie Hall alter-ego Alvy Singer. In Allen's breakthrough mainstream success, he described himself in a youthful flashback featuring a Marilyn Monroe look alike as a person who always had a hard time telling the difference between imagined and actual reality. Thus, a Williams/Allen hybrid by way of Blanchett – as the film opens Jasmine arrives in San Francisco and settles in with the hardworking, blue collar, divorced mother of two, Ginger. Revisiting the same complex sisterly sibling dynamic evident in Interiors and Hannah and Her Sisters, as the two women – a complete study in contrasts – try to make the best of the situation, it becomes obvious that Jasmine’s arrival is the equivalent of a powder keg ready to explode in Ginger’s relationship with her loving but hotheaded, fittingly-named boyfriend Chili (Bobby Cannavale). Nosy and loud, intriguingly Chili is the only one able to see through all of Jasmine’s pretentions and phony heirs to call out the way she’s alternately neglected and taken advantage of Ginger in the past. Adding to this, the film relies on repeated flashback sequences to jump forward and backward in the narrative to offer us a glimpse at the unromantic reality behind the breakup of both sisters’ marriages. Focusing on the way their relationships started to go downhill when Ginger and her then-husband (Andrew Dice Clay) visited Jasmine in New York and began to see the truth behind Hal’s façade as he two-timed Jasmine – the beginning of the end for all was set in motion when Jasmine foolishly talked her relatives into trusting their hard-earned life savings to Hal to invest. A multilayered film that’s richly acted and interpersonally complex by way of the number of subplots and characters it’s able to successfully juggle without shortchanging any of them, Blue Jasmine further shows respect for its audience’s intelligence by unveiling the events of two different timelines simultaneously. And due to its dense structure, a second viewing makes you appreciate the way it cleverly pays off on ideas and lines in one narrative a few acts later on in the second timeline. 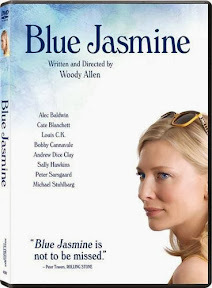 Yet perhaps Blue Jasmine’s greatest feat is in the way that it never foreshadows its most surprising character driven plot twist that leaves viewers stunned and likewise eager to go back and rewatch certain moments for a second or third time since it makes us rethink everything we thought we knew about a given character. A daring film in which the whole success of Allen’s emotional rollercoaster hinges on an unreliable narrator that’s forever changing her story, getting lost in the past and altering the facts of any given situation to best deal with the crisis at hand – Blue Jasmine serves as a stunning showcase for Cate Blanchett’s unparalleled talent. 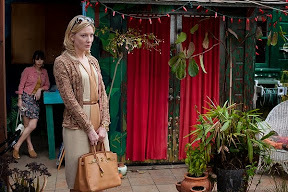 As much an exploration of what happens when the American dream falls apart as it is a portrait of a woman under the influence of fantasy, Blue Jasmine is as topical as it is timeless. Not just Woody Allen’s strongest film since Vicky Cristina Barcelona, Jasmine is certain to have a much greater impact than Vicky in the future as one of his most rewarding contemporary classics that recalls the existential exploration of life on display in his ‘70s and ‘80s masterpieces. In other words – and much like its main character and leading lady – Blue Jasmine stands alone indeed.